This past weekend a bunch of area bloggers got together for the first Portland Bloggers’ Meet-Up of the year. The theme for the January meet-up was “Give your blog a buzz in 2013.” The whole idea was to re-energize our blogs with new ideas, goals, and a PLAN! 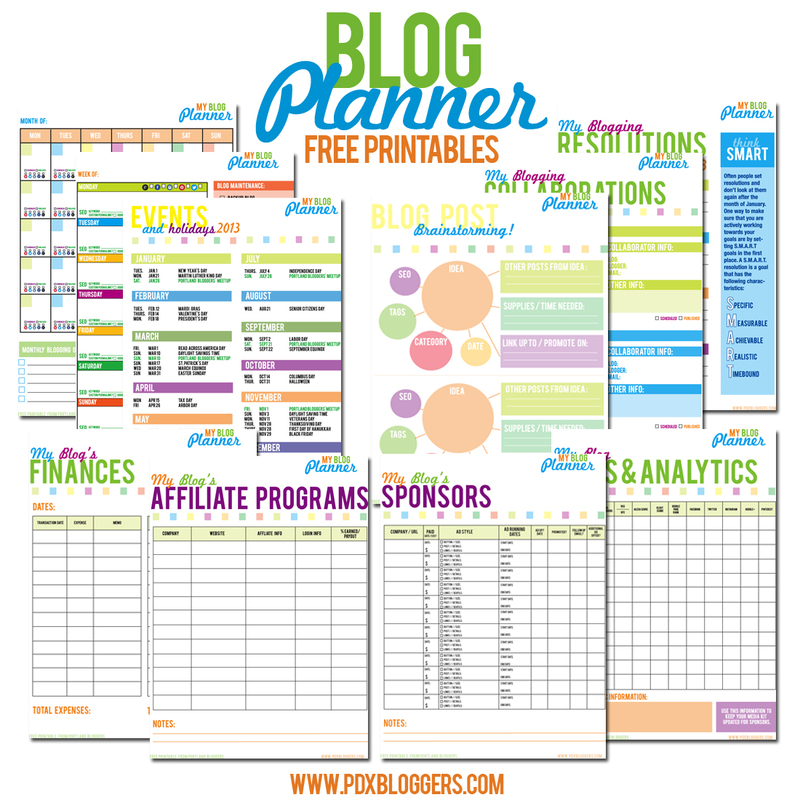 I created a printable blog planner to help the bloggers in attendance find a way to organize their own blogs. Not each of these sheets will be useful to everyone. And, some of the items on the sheets may not be used by every blogger. But, you might just find something you like on the printables! Monthly Blog Post Planning Calendar— Each sheet has an open month calendar so that you can put the month and dates in. Each day on the calendar has popular social networking symbols with check boxes so that you can check off when you’ve promoted a post. Weekly Blog Post Planning Calendar— Some people prefer to plan out their blog posts in more detail and on a weekly basis. The weekly calendar also has social networking symbols. It also has an area for weekly blog maintenance and SEO planning prompts. Events and Holidays— A list of events and holidays. This is not a comprehensive list by any means… it also has all of the dates for the upcoming Portland Bloggers’ Meet-Ups. Blog Collaboration Worksheet— A place to track collaborative projects and responsibilities. Sponsors— A place to track sponsors, payment, and responsibilities. EDIT: All original files were stored over at a PDF hosting site. We’ve moved them over to A Well Crafted Party (the creator of the printables) for easier download! Enjoy! I couldn’t make it this time after all, but am still hoping to join a meet-up soon! We can’t wait to see you at one of the events! It is going to be a FUN year! Yay! Thanks! And, I hope you can make the next one (march 10) time/place tba! It is going to be such fun! This is awesome!!! Such a comprehensive and usable set!!! Thank you for sharing! You are so welcome! Thank you for stopping by… by the way, if you are ever in Portland let us know! Awesome Jenni, these are great! This is wonderful. I wish I lived in Portland so I could be part of this group. Thank you for sharing; I’m going to get started on my blog plan right now! Let us know of you ever visit! We’ll throw an impromptu get together! Wow. Several of these forms were exactly what i’ve been looking for and/or trying to create myself without success. Thanks! Good to hear! I hope they are useful… Thanks for visiting the blog! Jenni, I’ve been saving them individually, but I’d LOVE to buy them as an organized set if that’s an option. Do you guys have anything like that? Brittany— GREAT idea… I am working on an update for this set that will include some fixes to the layout (some things I’ve noticed while in use at home) and adding a few new pages. I will make sure I have them as an organized set as well! This is so cool! I need to utilize this. Never thought it would happen, but I’m – like – fourteen blogs behind. And no real way of planning ’em in sight. Hopefully these sheets help! I’ve also heard some of the bloggers talk about planning their posts on Google Calendar… I use a combination of paper and Todoist.com. However, I am very behind myself at the moment! Alas, these are neat and I think they would be great…but I’m not a scribd. member. 🙁 Oh well. It should be a free download through scribd. A lot of people have already downloaded for free. I’ll double check to see if anything has changed. Apparently they have a 7-day Free Trial that can be done in order to download for free. 🙂 Mission accomplished. Thanks for replying! jenni–could i just buy these from you on etsy or paypal? i don’t want to pay scribd $9 when they’re your materials. LMK. I don’t understand what is going on with Scribd… I’ve never had to pay for membership. I do have to login via Facebook… but, haven’t had to ever pay. I’m trying to figure out a better method of providing these for free to everyone. However, in the meantime… I’ll email them to you! Sorry for all the trouble! That would be why I’ve never had a problem– I’m a contributor! Thanks for finding out for me. I’ll make sure to find an alternate place to store those ASAP. Wow! Super awesome – you’ve made my day! And so quick too! Great Idea! We will look into that for our 2014 edition! I’ve tried going to the site to download and it does not open. Is there another site to download the planner? Thank you! Found these on pinterest, there awesome! Definitely going to help me get organized! Thanks for sharing! 100+ FREE Printable Organizer Pages | That's Pretty Geeky! Wow, really cool design. Inspires me to blog everyday.